Say goodbye to dull, chalky fiberglass and say hello to a glossy, smooth hull! Marine 31 boat compounds and boat oxidation removers enable you to restore the gloss and color to your boat’s finish with minimal effort. Each Marine 31 gel coat compound was developed, tested and fine-tuned right here in South Florida so you can restore the shine and luster to your boat’s finish with confidence, even in direct sunlight. We’re often asked the question “What makes a boat compound so special?” Well, there are quite a few things, actually. 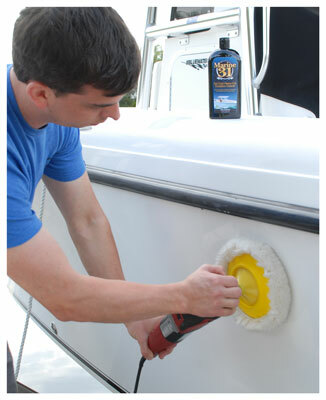 Every Marine 31 boat compound and boat oxidation remover features a special type of abrasive that was designed to remove oxidation, yellowing and surface staining without dulling the finish or inducing swirl marks. Marine 31 boat compounds and boat oxidation removers are also rich in oils designed to hydrate the gel coat finish, maximizing gloss and color. What’s more, all Marine 31 boat compounds and boat oxidation removers are exceptionally easy to apply and remove – no dusting! Boat Compounding Tip: Long live the wool pad! If you’re working on a heavily oxidized, chalky finish, a foam pad simply isn’t going to cut it (literally!). A wool pad, like the Lake Country Purple Foamed Wool (Dual Action Polishers) or Lake Country Twisted Wool Cutting Pad (Rotary/Circular Polishers), will remove oxidation much quicker. Be sure to clean your pad often using our Foam Pad Conditioning Brush or Wool Pad Spur.